The car has been pulling to the right for the past 6 months. Around that time I also noticed that the right rear tire looked bent with the whole right side not looking straight. So i went to the dealership this past week and they told me I had cracks on my thrust rod bushes and wishbone lower control arms. So they changed them both and did the alingment. Now the pull is gone but the rear wheel still looks bent from the back. Ps I didnt get into major accidents so I dont think its my frame. Atleast I hope so. Looks like the right rear is going in from my pov. Driver rear doesnt match passenger side at all. Personally, with all the reflections I can't see what you're saying/seeing. From the picture thats what I see, its hard to tell without physically being there. Try measuring the tire to fender length on both sides and check the difference, also you can use a string from the front to rear on both sides make it square though and measure. Set up 4 cones or whatever to hold the string and see if it is unaligned. Passenger side, rear wheel looks like it's toed in (angled towards the centerline of the car facing the front). Even if the car is running straight, you'll want to get that fixed if possible. It'll wear quicker than your other three tires. Every BMW I've ever had has rears that look like that. Some body style curves at the rear wells accentuate it more than others. Toe in and negative camber at the rear is normal, in the spec, and that's probably all you're seeing. Take some comfort that you have a fresh alignment report on hand that says everything is fine. It is still true that this specification wears rear tires faster, but that doesn't mean something is broken. 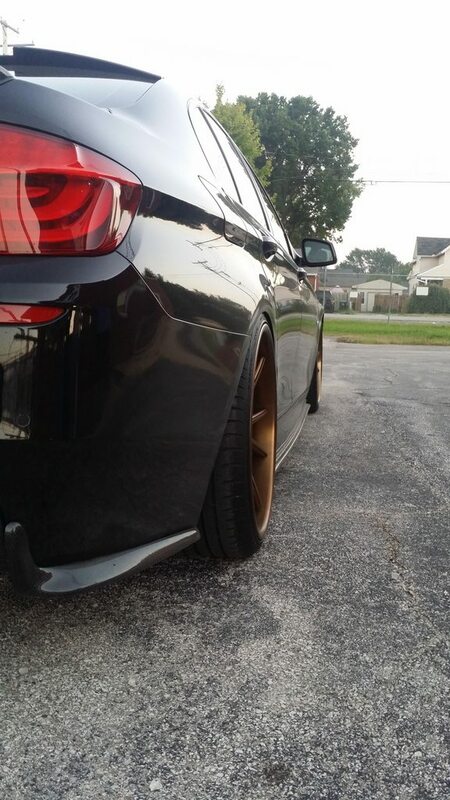 BMWs are known to have negative camber coming from the factory. Most find themselves replacing tires when they look good from the outside but when you take the wheel off and look on the inside of the tire you have excessive where compared to the rest of the tire. When you get the car aligned ask them to try to get your camber as close to zero as possible. I think we need 4 wheel alignment so it should show with alignment if it is off. Help. So even after checking the chassis which was fine And countless alignments the car still doesnt look straight when parked. The tires just dont look aligned even when taking the rear negative camber in mind. Is it possible for a bent control arm to cause this issue??? Because I remember hitting a curb around 6 months ago on my rear right wheel at around 10mph. Maybe that caused some bent suspension parts that caused this whole issue ? Its even more embarrassing that the dealer cant find the issue which should be simple if the chassis is fine.